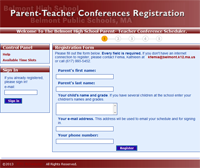 In an effort to save time for both parents and staff, the Belmont Public Schools has implemented online parent/teacher conference registration. Register for conferences 24 hours a day, 7 days a week during the registration period. In two simple steps schedule a conference by choosing an available conference time slot. View, print, and e-mail their conference schedule. Return at any time to reschedule a conference. access their schedules with listings of all registered parents and parents’ contact information. Conference dates and registration will be announced by each school and posted on the district web calendar. If I have difficulty registering, who do I contact? Please contact the Conference Coordinator by using this form.